It was way beyond our wildest dreams! 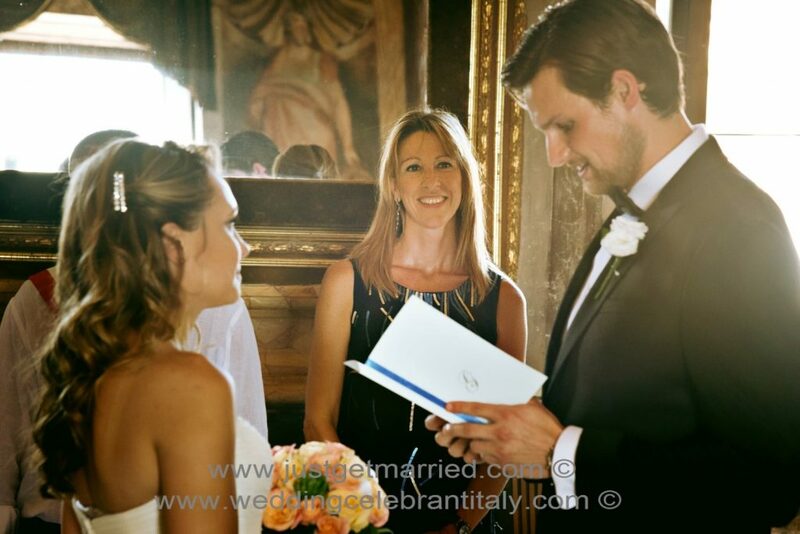 I must thank you and all Just Get Married in Italy wedding team for everything that you have done! Not only did the experience blow us away but all of our guests have said it was by far the best wedding they had ever been to. Would you also be kind enough to pass on our thanks to the hotel staff, Father, the musicians and the drivers who all helped make the day wonderful. 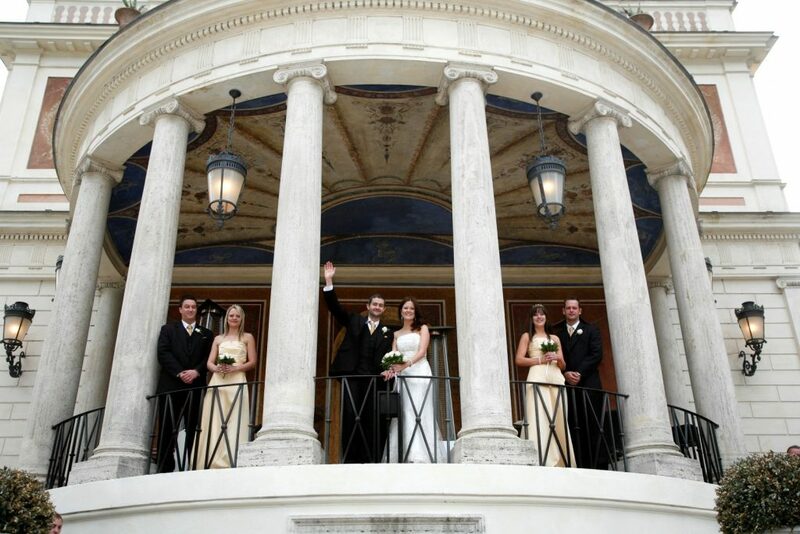 I always dreamed of getting married in Rome… We dreamt of a wedding similar to that in one of the Godfather films! They had large tables outside with a band playing and all of the guests relaxed and happy enjoying the day. 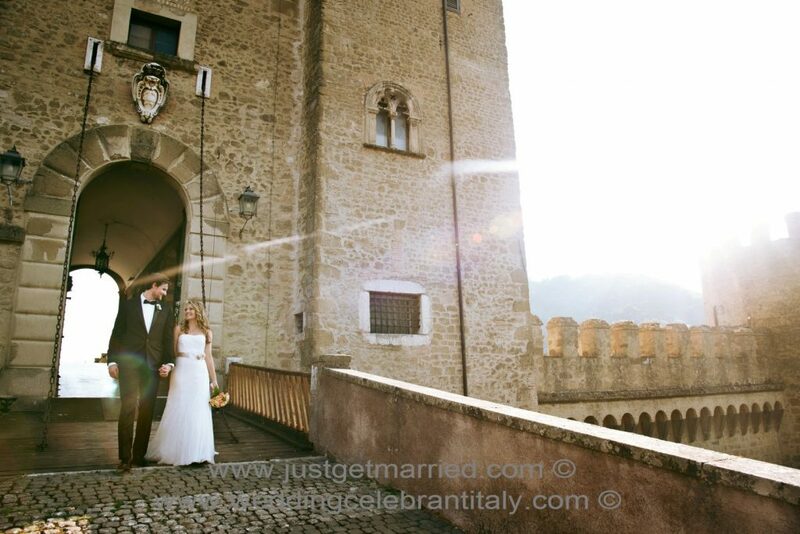 The girls at Just Get Married in Italy took my wedding ideas and turned them into something that was way beyond our wildest dreams. We have watched many of our friends plan weddings and they cannot believe how stress free the planning of our wedding was. Deborah really made the process very enjoyable and when there were any small delays or hiccups Deborah helped to resolve any issues before we even had time to get stressed. We had a beautiful romantic service in a small church close to the Colosseum, followed by drinks in the beautiful peaceful gardens around the church. My only suggestion is that if you decide to have a singer at the church bring plenty of tissues for your guests as almost every one of our 48 guests cried when they heard Ave Maria it was so beautiful!!!. After the ceremony I loved the idea of our guests being able to see a little bit of Rome whilst having photos taken along the way. 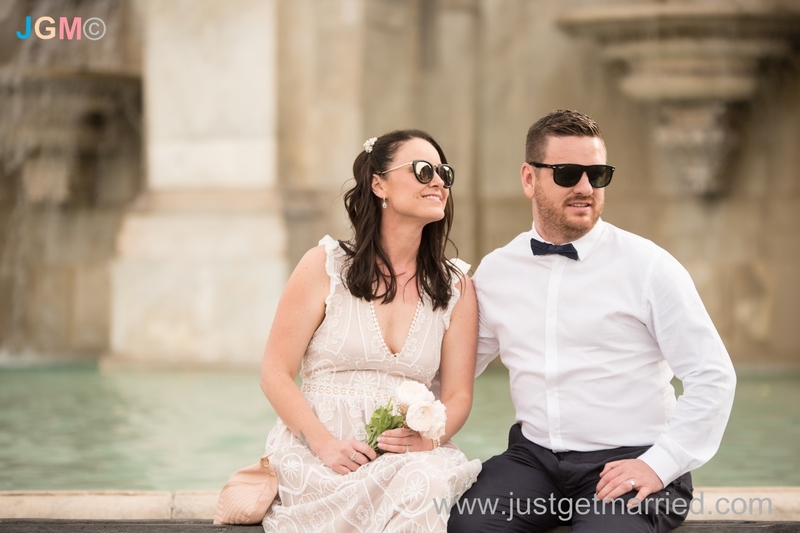 Guidy and Gabriella made a fantastic suggestion of a few places and our guests had a fabulous tour of St Peters, The wedding cake and many other places. 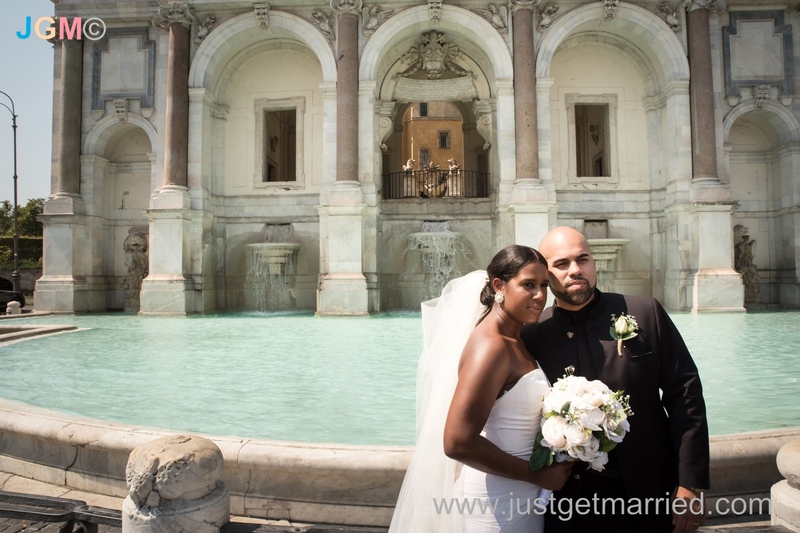 By the time we arrived at the hotel for our reception every guest was in love with Rome and they could not stop talking about what they had seen. As the Italian people are so romantic we were blow away by the fact that so many strangers approached us to warmly wish us congratulations. This was then followed with a beautiful meal accompanied by a jazz band on a roof terrace overlooking the Colosseum by then we were completely blown away by the fantastic job that everyone involved had done. The reception service from the hotel amazing, from the food to the decoration of the roof garden and last but by no means least the amazing view of the Colosseum lit up at night. The best thing about Just Get Married in Italy was the little added extras that we were not expecting such as the parcels of Rice for our guests to throw, the little gifts for the children to keep them occupied and my personal favourite, the beautiful ribbon covered in butterflies and wind-chimes that we had to cut through to declare the party open. They had thought of everything and we will never forget the hard work that Deborah, Gabriella and Giudy put in to give us the best day of our lives. We often have to keep asking ourselves whether or not it was all a dream as it was too good to be true. 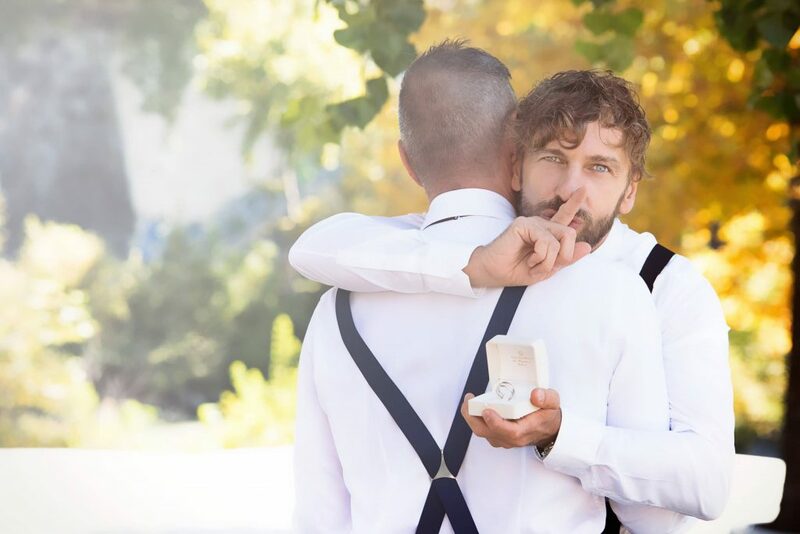 Luckily we have the beautiful wedding photographs and wedding video to remind us. We can’t stop looking at the photos and watching the video and we just think it was a wonderful way to start our married life together. Thank you again and if you ever need myself or Mark to speak to new couples who may be unsure we would be happy to sing your praises. 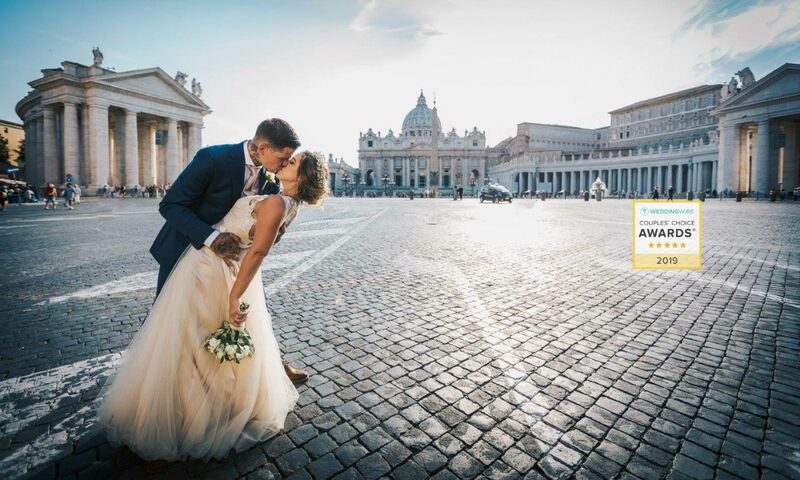 Thank you for all your help in organising such a great Wedding Event in Rome! 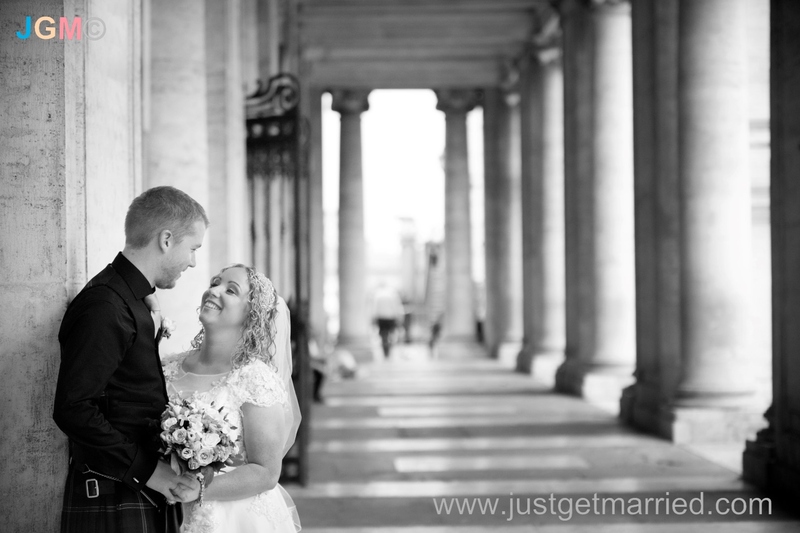 We got married in a beautiful catholic church at the Roman Forum, sourced by Just Get Married in Italy! 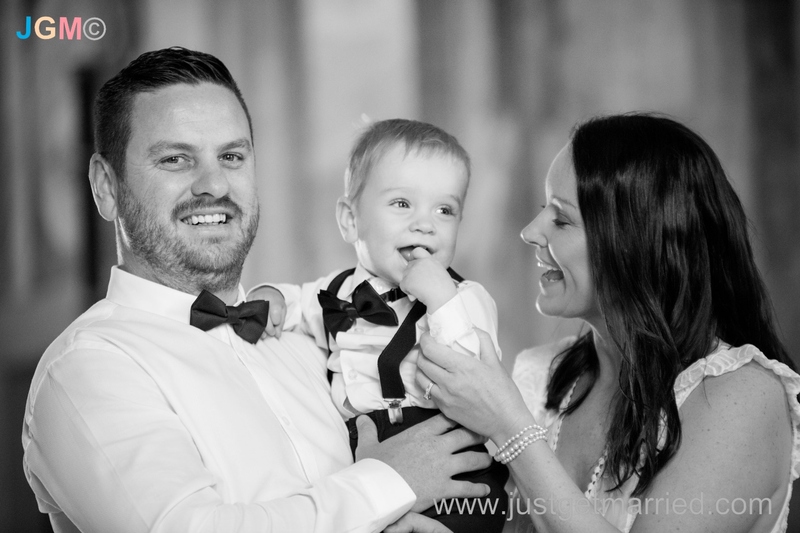 All wedding services provided by Just Get Married were superb! 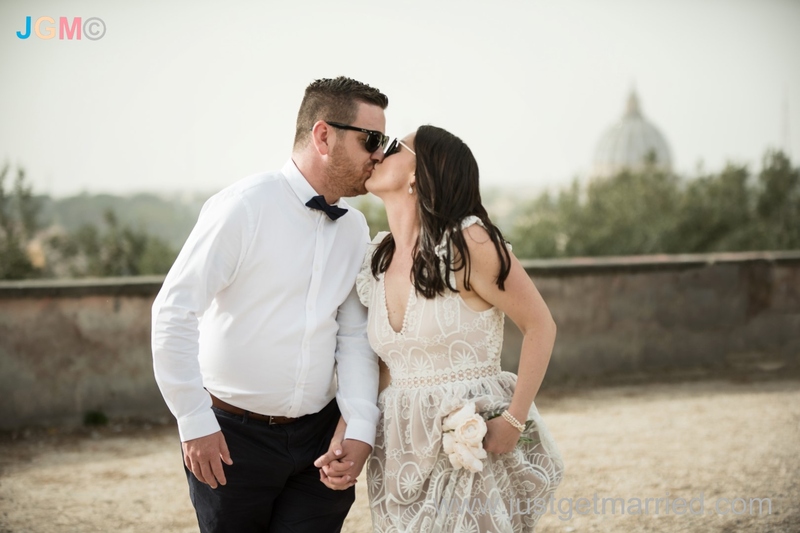 The wedding flowers gorgeous, hair and make up amazing, and the Roof Terrace reception at Casina Valadier in Villa Borghese gardens really took our breath away! We cannot thank you enough for all your patience, professionalism and assistance provided throughtout the planning and on the wedding day. 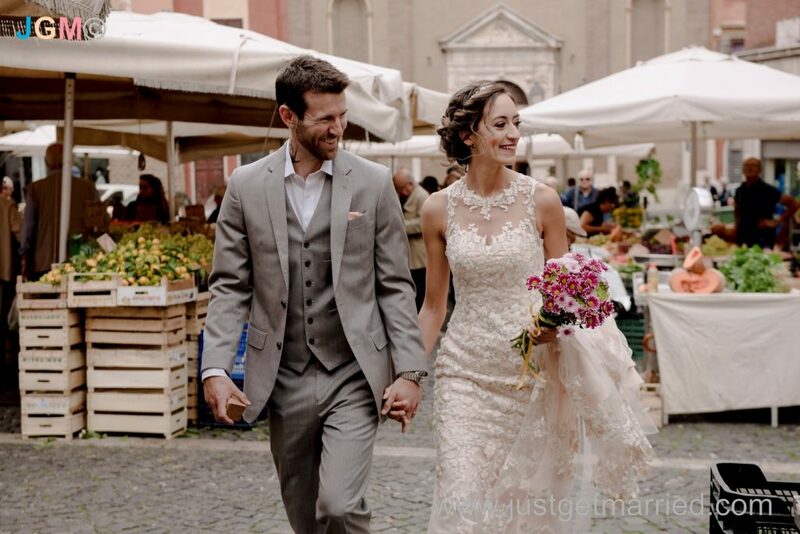 We are happy to recommend ‘Just Get Married in Italy’ ‘Top Class’ wedding planning services to any couple who wish to get married in Rome or anywhere in Italy! My husband and I are so happy we hired Deborah to officiate our symbolic ceremony! We traveled from the United States so we were unable to meet Deborah prior to our wedding day, but she was very good about communicating with us via email during the time leading up to the ceremony. All communication was prompt and professional and any questions we had (there were many!) were answered to our satisfaction. On the day of the ceremony, Deborah arrived early to ensure all was set up and ready to go. The ceremony was beautiful and well-planned thanks to Deborah – we couldn’t be happier with our decision to hire her for our special day! Many thanks! 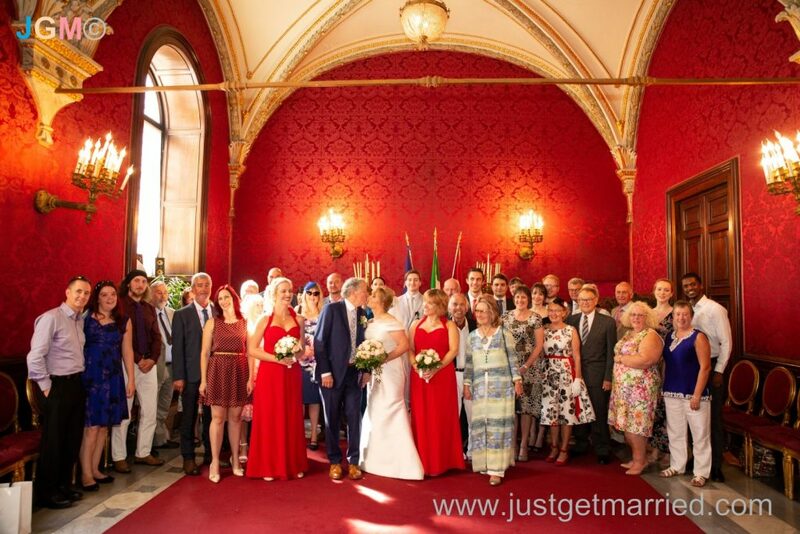 A heartfelt thank you for helping us have the elopement of our dreams in Tivoli. you were absolutely amazing to work with and there is no way we would have had the perfect wedding in Italy that we did if we didn’t have you. 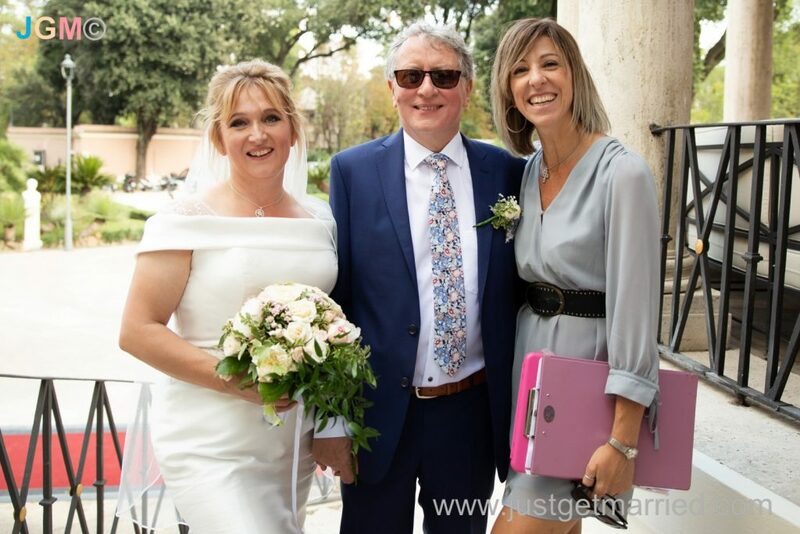 Thank you for choosing Tivoli for us – such a gem of a town near Rome and with the funniest ceremony officiant to marry us (He was the Best!). Thank you for booking the talented hair/make up artist – she gave me exactly what I was imaging and made me feel so beautiful on my wedding day! Faultless from Beginning to End! A Wedding Day we’ll never forget! Faultless from Beginning to End. 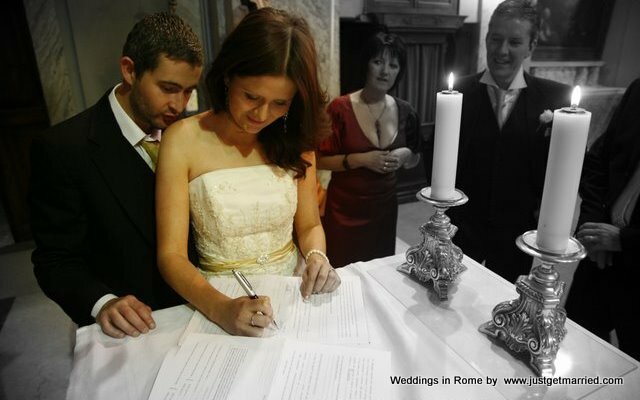 Chris and I knew that we wanted to marry in the Sala Rossa in Rome, and initially engaged ‘Just Get Married’ to complete the legal paperwork required for our Marriage. Deborah guided us through the steps involved with absolute clarity. 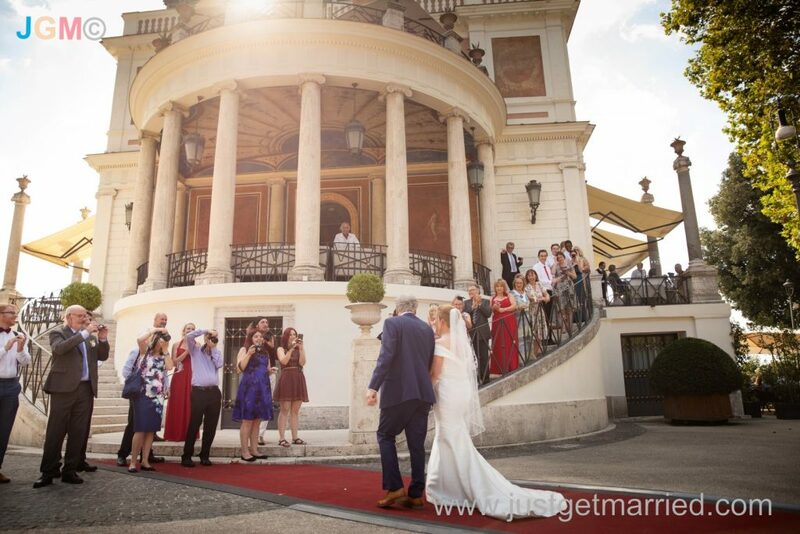 We then engaged JGM to organize the reception and among the excellent recommendations made was the Casina Valadier! 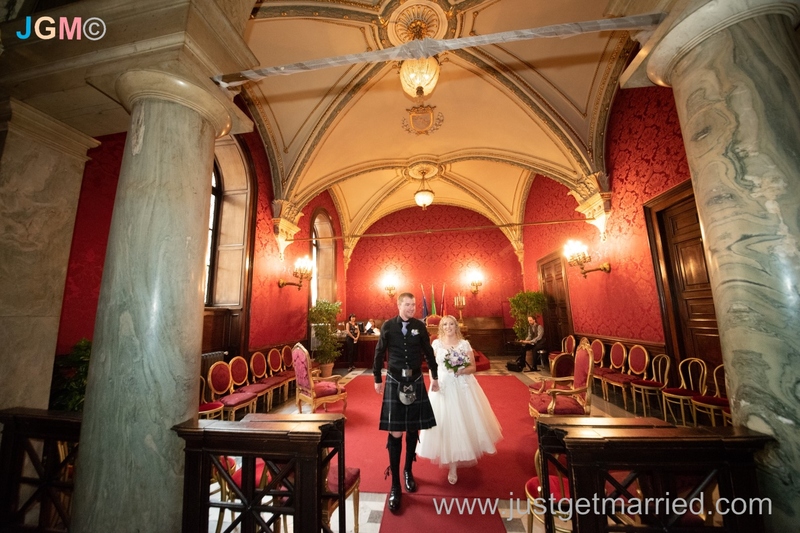 This was the most amazing venue we could have wished for! Wow – the epitome of Hollywood glamour with it’s long red carpet and beautiful Sala degli Specchi [room of mirrors]. 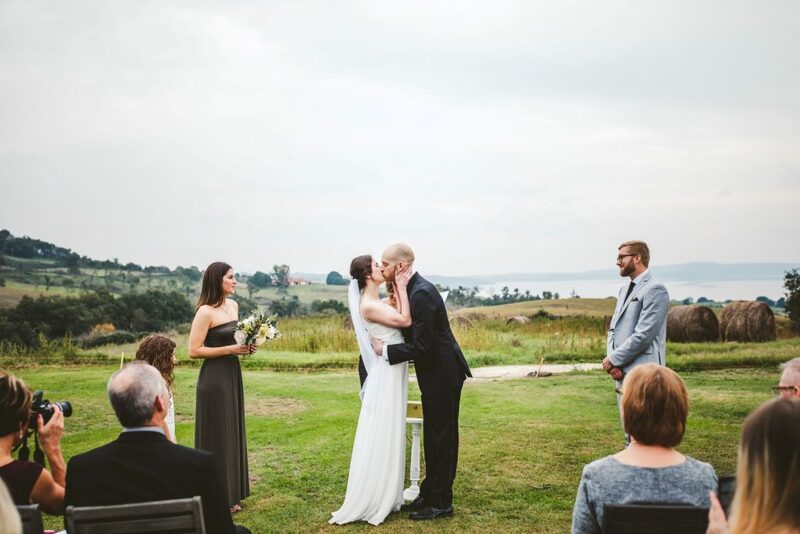 It made our dream Wedding come true in every respect! From the moment we arrived in Italy, Deborah was with us every step of the way! 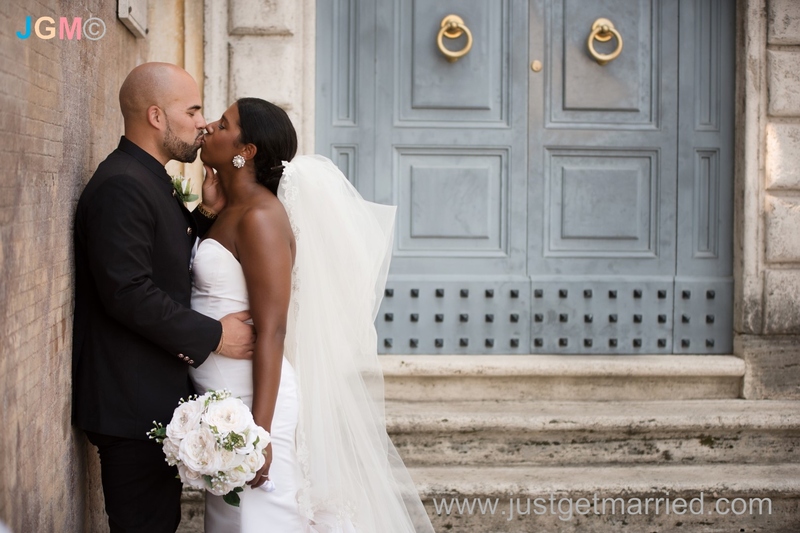 In summary, the JGM team was absolutely invaluable to us, and we wholeheartedly recommend them to anyone wishing to marry in Italy! 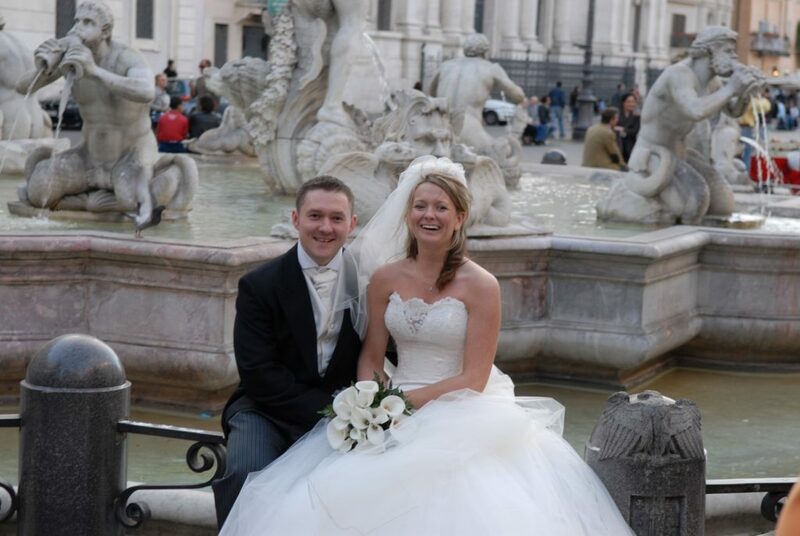 ” Hi Deborah I would just like to say thank you so much for all your help and assistance in organising our wedding in Rome. You and your team were amazing and helped make it as stressless as possible. From the moment we made contact to organise your services tho have been so professional and prompt in replying to any emails or queries. On the day you and your assistant helped make everything go as smoothly as possible and that made all the difference. 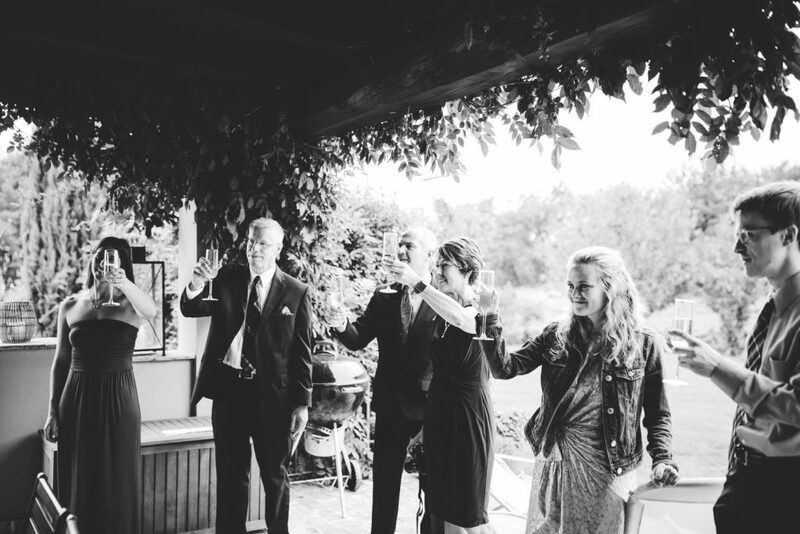 All the guests were commenting on how great it was to have someone to guide them and tell them where to go next. When Sam and I were driving around Rome for photos after we felt like celebrities with all the people cheering and clapping! It was such an amazing feeling and is testimony to the warm welcome we always receive when visiting Rome. Guests are still talking about the food and amazed at how much there was! I don’t know how all you Italians manage to eat the meal and manage to dance after. We would need a little nap between food and dancing! I loved my bouquet and the colours matched in perfectly with the bridesmaid dresses. The wedding cake went down a hit with guests and was exactly what we had described! Both drivers of the vans were very friendly. In particular the driver Sam and I had, he was very chatty. When daddy and I were going to the ceremony he was pointing out local historic attractions which helped calm our nerves! 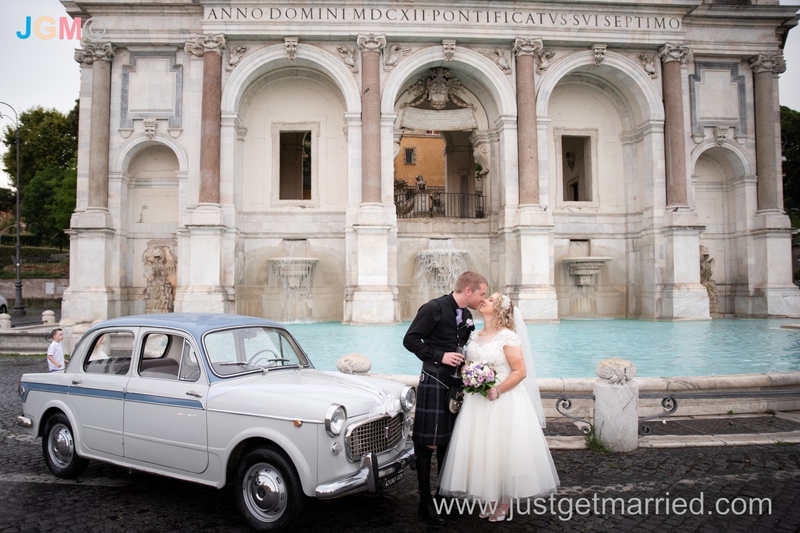 The photographer was so professional and took time to make sure she captures the best images- we were surprised that she was brave enough to walk in the road infringe of cars, considering how crazy the traffic can be in Rome! The first emails. You and your team helped us to have the wedding day we dreamed of. There is no way we could have achieved the same day by ourselves. 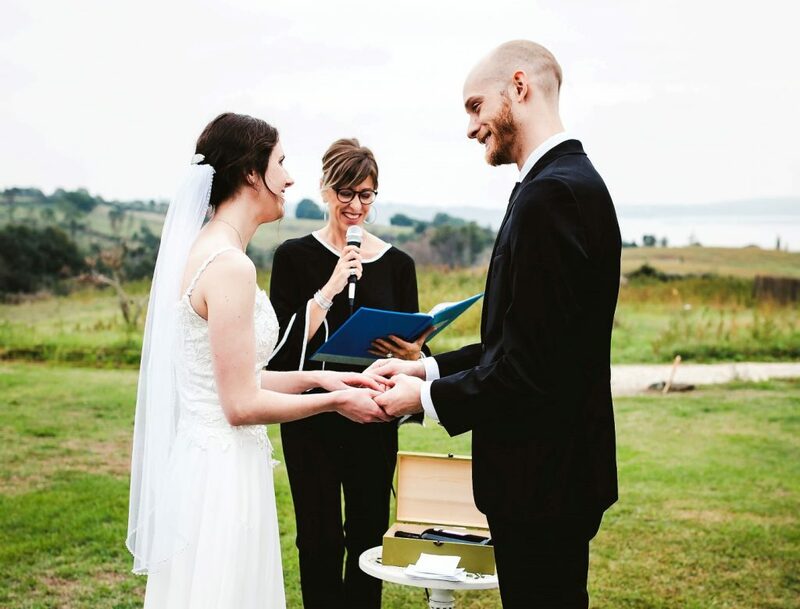 You helped take the stress out of organising the wedding.